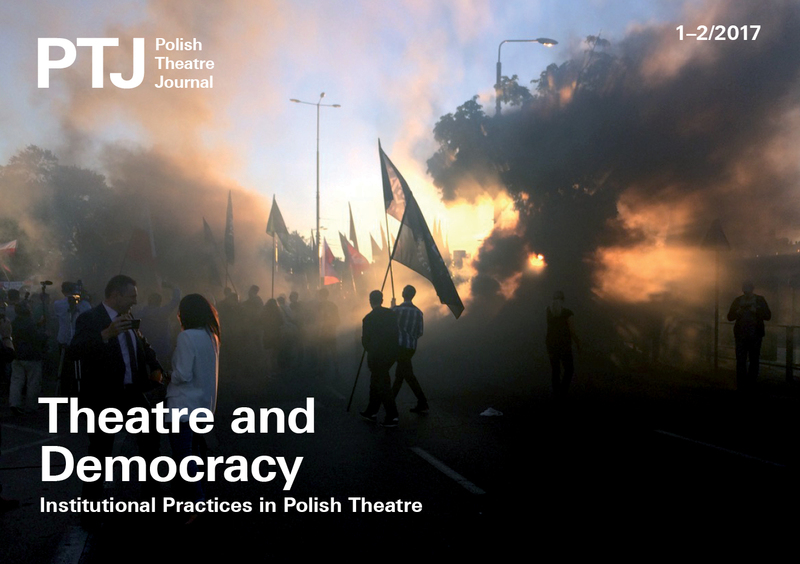 In the third issue of Polish Theatre Journal, we examine institutional practices in Polish theatre in the context of political and social changes. We analyse conditions for freedom of artistic expression and of mechanisms of censorship; we observe significant conflicts and struggles in theatre life, and scrutinize the entanglement of economic, political and aesthetic determinants. We query the possibility of making theatre institutions into social laboratories in which cultural practices for the new democratic order can be developed. We have been working on the third issue of Polish Theatre Journal as, in Poland, the most intense social conflict and political debate has arisen since the political transformation began after 1989. This conflict extends over all spheres of social life and relations of our country within the European community. The government of the Prawo i Sprawiedliwość [Law and Justice] party, ruling for the last two years and still enjoying high social support, has brought about a definitive right-wing turn on the Polish political scene along with many radical changes related to the foundations of the democratic system and state institutions. That support demonstrates the scale of discontent with the liberaldirection of this government's predecessors: the sense of lacking self-efficacy and of social inequalities growing among Polish citizens. However, in the opinion of a considerable segment of society – as evidenced by increasingly numerous and consistently organized protests in the streets of Poland – the changes introduced by this government endanger fundamental civil liberties and democratic institutions, such as independent courts and non-governmental organizations. Culture is definitely one area of constantly escalating political conflict in Poland. It may even be that the conflict's true nature reveals itself here. The present project of national culture, reinforced by the government, has been designed to some extent as the eradication of public – or civic – culture in its many fundamental functions and essential features, including the programmatic autonomy of institutions and freedom from all forms of censorships, while fostering civil society and wide inclusiveness. According to unambiguous declarations by the current government, the role of national culture is to build an essential identity drawn from a narrative about the exceptional fate of a nation struggling against totalitarianism, which must lead to the turning of Polish society away from challenges of the globalized world deep in crisis, and towards a nationalistic isolationism. That dynamic, dramatic process sets the perspective from which we look in this issue of PTJ at institutional practices in Polish theatre and in Polish performing arts, asking about the kind of institutions we need – especially in such times of grave crisis – and whether the current institutional model of the arts can efficiently contribute to the democratization of public life. This issue begins with a series of articles devoted to the most notorious conflict to have shaken Polish theatre in recent years, related to director Oliver Frljić's production Klątwa [The Curse], premiered at the Powszechny Theatre in Warsaw in February 2017. In this production of a revered Polish play by Stanisław Wyspiański, the director purposefully violated rules of rational debate and unleashed strong affects, exposing an ostentatious disbelief in the possibility of rationally criticizing the Catholic Church within the context of that institution's overwhelming dominance and the resulting structural censorship in the Polish public sphere, which is discussed by Agata Adamiecka-Sitek in ‘How to Lift the Curse? Director Oliver Frljić and the Poles’. The production's objective was to reveal a vivid social conflict which could not be articulated in such an acute form without this artistic intervention. The reactions of local authorities in the capital, entirely respecting the Powszechny Theatre's autonomy, the intervention of the minister of culture in his calls for censorship, reactions of the Polish Episcopate and individual priests, a siege of the theatre by nationalist cadres, manifestations of solidarity with the artists, the setting in motion of prosecution proceedings – all these events comprised a social performance initiated by the production, which then offered a constantly updated message about the state of our democracy and of our public sphere. In the conversation with Frljić, we analyse this strategy of performing institutions, and in the interview with the managing directors of the Powszechny Theatre, we observe the process taking place within theatre as a result of direct involvement in this major social conflict. The article by Ewa Majewska, written before the conflict around The Curse arose, should be read in this context. In ‘Censorship as the Formative Mechanism of Neoliberal Culture? The Productive Function of Prohibition’, Majewska observes various forms of censorship in Polish art in recent years, pointing out strategies of effectively transforming such prohibitions into culture-formative mechanisms of widening the area of commonality, and thus becoming an answer to restrictive practices of the authorities. We have no doubt that – as Dorota Buchwald writes in ’Institution: the Defence of Necessity’ – a wide network of a hundred and twenty public theatres in Poland, which scoops up the vast majority of public funds allotted to theatre, is our common good and we should defend this good against both the mechanisms of aggressive economization and political instrumentalization by local authorities and the government. However, as Marta Keil inquires in ’What is the Purpose of Institutional Critique Today?’, is the effective struggle for public theatre even possible and meaningful without critical reflection on the way its institutions are organized and what purpose they actually serve; which mechanisms determine their production processes and work by their employees; are they a space for empowerment and cooperation; can they become vehicles for inclusiveness and a buffer against exclusion? Or perhaps they remain the instruments of class distinction, spaces for hierarchical power, alienation and exploitation of the need for fulfilment? An interesting perspective of looking at repertory theatre as a specific work environment, entirely absent in previous research, is provided by Zofia Smolarska in ‘Institutional Gastroscopy: Publicly Funded Theatre in Poland, Diagnosed by Its Craftspeople’, on the disappearing profession of theatre craftspeople and their position within the structure of repertory theatre in Poland. The subjectivity of actors and actresses in Polish public theatres is the topic of ‘The Actor in the Deadlock of Contemporary Folwark Relations’, in which Monika Kwaśniewska analyses instances of conflicts between actors and managing directors, especially the year-long struggle of the team at the Polski Theatre in Wrocław for the artistic form of their institution after the competition for the position of managing director was won by a person the team would not accept. Weronika Szczawińska and Romuald Krężel related to their own experience of functioning within the Polish theatre system and indicate the ossification of public theatres around the model focused on managing directors and production directors which radically limits the sphere of explorations in the field of methods and aesthetics conceived together as a space for real experiments (in ‘ Theoretical Democracies, Practical Institutions’ and ‘The Emancipated Artist’, respectively). Public theatres, as Szczawińska argues, operate similarly to early capitalist factories, working ‘for the power of the market’, where the hierarchy and its related strict specialization exclude any shifts and block the flow between the fields of theory and practice. However, environments with the strongest currents between theory and practice, such as contemporary choreography or the phenomenon termed post-theatre, remain at the margins of the system, without institutional or financial support. This field is represented in our present issue of PTJ by creators and curators in conversations about the situation of Polish dance and the phenomenon of the Komuna// Warszawa ensemble (‘When Is Poland’s Sasha Waltz Going to Appear?’ and ‘How Komuna Otwock Became Komuna// Warszawa’). Theatre is the field of art where the radically cooperative and common character of human life is revealed in the strongest form. The collective way of creating and receiving theatre, its essentially social nature, makes it the space in which it becomes possible – or even necessary – to search for answers to the collapse of democracy and to develop new models of social order. In ‘Beyond Participation’, Igor Stokfiszewski associates hopes for such influence by the arts not with repertory theatres but rather with actions in the domain of social art, the animation of culture and theatre pedagogy. Writing about real social inclusiveness and co-participation which would go beyond the ‘great sham of the nightmare of artificial hells of participation’, Stokfiszewski returns to Walter Benjamin's definition of the political efficacy of art. If art is supposed have an actual social influence, it has to change its own ‘production apparatus’, that is, production processes and management mechanisms, as he repeats after Benjamin, then analysing the radical instances of the Teatro Valle Occupato community and the arts association Les Têtes de l’art. Such ‘production apparatus’ of art have the chance to become social laboratories in which cultural practices for the new democratic order may be developed. Under the heading ‘Other’, this issue gathers case studies for arts groups and collectives important in the panorama of Polish theatre, at work over the years and even decades outside the system of public theatres yet identifying with the same public mission. These exemplars – Marta Górnicka’s choral theatre (‘On the Common Good’ by Jan-Tage Kühling), Komuna// Warszawa, Centrala and thelegendary group Akademia Ruchu [Academy of Movement] ( ‘Can Centrala Save Us?’ by Kamila Paprocka-Jasińska and ‘The “Open Activity Academy”’ by Zofia Dworakowska) – enable us to follow relations between the "production model and aesthetics of performances, and types of interactions with the community. These analyses of institutional practices in Polish theatre are also situated within the international context. Andrea Tompa looks at the changes in Hungarian theatre brought about by Victor Orbán’s government (‘And the Winner Is...: Appointing Artistic Directors in Hungary’), especially in terms of autonomy of institutions and freedom of artistic expression, which in Poland today makes for very instructive reading. Henrike Kohpeiß writes about the struggle for the Berlin Volksbühne and the clashing ideas of the social function of theatre (‘Who Wants a Theatre Company and Doesn’t Have One?’). In ‘The Insitutional Practices of a Festival’, Marta Keil employs a wide international perspective to observe the evolution of festivals and their procedures of producing and circulating art. Keil demonstrates the strong entanglement of festivals in neoliberal mechanisms and attempts to answer the question about the way they can develop their critical and emancipatory potential, and contribute to common space. Intentionality and historical perspective also constitute the context in which we ground the recent proposal to return to the idea of the ‘popular theatre’ – theatre for the people – which appeared in Poland thanks to Maciej Nowak’s essay, reprinted in this issue. With his manifesto ‘We, the New Public Theatre’, Nowak calls for creating a new, common alliance with the audience, which would transcend class limitations and be open to a real diversity, freeing theatre from the alienating ‘performances of superiority on the part of the intelligentsia’ and freeing it from the vicious circle of culture wars. Yet doesn’t even begin to reflect on the institutional model which would provide firm grounding for such alliance and thanks to which that alliance could in actuality be practised. However, without the necessary self-critical work at the institutional dimension, the idea of ‘theatre for the people’ can only remain a rapidly ossifying dream of democratizing art, a fantasy about a cross-class and cross-generational community, as shown by Piotr Olkusz and Ewa Bal in their articles analysing experiences of directors Jean Vilar (‘The Pope’s New Clothes’) and Giorgio Strehler (‘On the “People’s Theatre”: a Glance Back’). In these times of deep crisis that we’re currently experiencing, a principal objective of the arts is to seek new articulations of the commons: possible forms of being together which would not attempt to eliminate differences between us but try instead to create a space to unveil antagonisms, while strengthening the senses of self-efficacy, subjectivity, participation and co-dependence. This purpose cannot be reached only through artistic communication or even through the most emancipatory projects expressed at the level of representation. Institutional practice and democratization in action remain as indispensable as ever!